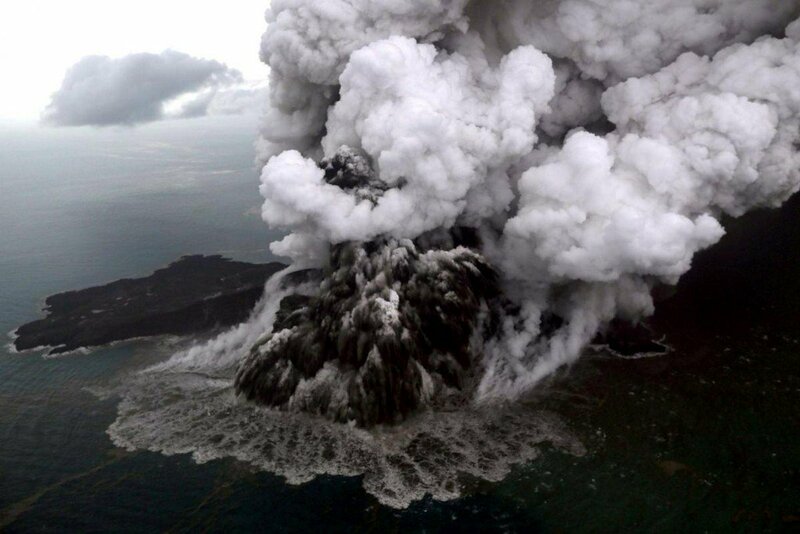 An aerial view of Anak Krakatau volcano during an eruption at Sunda strait in South Lampung, Indonesia. Indonesia on Thursday raised the alert level for the erupting Anak Krakatau volcano to the second-highest, and ordered all flights to steer clear, days after it triggered a tsunami that killed at least 430 people. A crater collapse on the volcanic island at high tide on Saturday sent waves up to 5 meters (16 feet) high smashing into the coast on the Sunda Strait, between the islands of Java and Sumatra. Authorities have warned that the crater of Anak Krakatau, or child of Krakatau, remains fragile, raising fears of another collapse and tsunami, and have urged residents to stay away from the coast. The volcano has been rumbling on and off since June but has been particularly active since Sunday, spewing lava and rocks, and sending huge clouds of ash up to 3,000 meters into heavily overcast skies. The national geological agency, in raising the alert level to the second-highest, set a 5-km exclusion zone around the island. “Since December 23, activity has not stopped … We anticipate a further escalation,” said Antonius Ratdomopurbo, secretary of the geological agency. A thin layer of volcanic ash has been settling on buildings, vehicles and vegetation along the west coast of Java since late on Wednesday, according to images shared by the national disaster mitigation agency. Authorities said the ash was not dangerous, but advised residents to wear masks and goggles when outside, while aircraft were ordered away. “All flights are rerouted due to Krakatau volcano ash on red alert,” Indonesia’s air traffic control agency AirNav said in a release. AirNav’s corporate secretary, Didiet K.S. Radityo, said there were no disruptions to any international or domestic flights. The civil aviation authority said no airports would be affected. The capital, Jakarta, is about 155 km east of the volcano. Indonesia is a vast archipelago that sits on the Pacific ‘Ring of Fire’. In 1883, the volcano then known as Krakatoa erupted in one of the biggest blasts in recorded history, killing more than 36,000 people in a series of tsunami and lowering the global surface temperature by one degree Celsius with its ash. This year, Indonesia has suffered its worst annual death toll from disasters in more than a decade. The latest tsunami, coming during the Christmas season, evoked memories of the Indian Ocean tsunami triggered by an earthquake on December 26, 2004, which killed 226,000 people in 14 countries, including more than 120,000 in Indonesia. Tsunami warning systems were set up after 2004 but they have failed to prevent subsequent disasters, often because apparatus has not been maintained, while public education and disaster preparation efforts have been patchy at best. Ramdi Tualfredi, a teacher in the village of Cigondong, on Java’s west coast, said he had never got any instructions on safety steps and efforts to prepare communities for tsunami had totally failed. “There were no preparations. I didn’t get information from anywhere,” he said, adding there had been little help for residents since disaster struck. Nearly 22,000 people were displaced by the tsunami, while 1,495 were injured and 159 are missing. Thousands of displaced are staying in tents and crowded into public buildings. Hamad Suhaimi, a teacher working as a volunteer at a school being used as an emergency shelter, said the numbers of displaced needing help had surged as authorities expanded the area deemed unsafe. Volunteers and displaced villagers said that conditions in the shelters were getting difficult, especially for new mothers and their babies. “We’re breastfeeding. We have to eat in the morning but food only comes at midday and there are no vegetables,” said 24-year-old Siti Sayaroh. The government has declared a state of emergency until Jan. 4, to help with the distribution of aid.